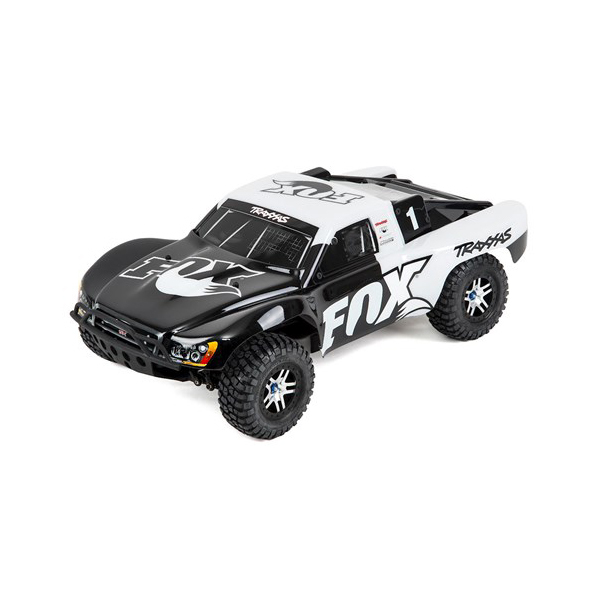 Show your skills and be the envy of your friends with the FOX branded Traxxas Slash Short-Course Race Truck that puts you in the driving seat for intense fender-to-fender, high-flying off-road action. Coming complete with a Fox branded shell, UK charger, battery, spare GUNK branded shell and RC controller this RC car is ready to go out of the box and is perfect for pretty much any terrain. Powered by the Titan 12T 550 modified motor the rear wheel drive truck is purpose built to fly over jumps and rip full-throttle through the turns. The Traxxas Slash hangs it out for an all new way to challenge your driving skills and features 4-wheel independent suspension and has been carefully tuned to replicate the driving and handling of the full size Pro 2 version. Spare Arie Luyendyk Jr/ GUNK shell included. Precision TQ 2.4 GHz controller. Water-sealed receiver box and steering servo. Metal gear Magnum 272 transmission. Revo-spec torque control slipper clutch. Traxxis 7 cell NiMH battery. AC to DC Power supply 40W/UK charger.